Safety Harbor has a long history as a therapeutic spa. A National Historic Landmark, it differs from other spas in having natural mineral springs. Indian shell mound builders settled here as long ago as 2,000 years, probably attracted by the waters which flow from five springs on the property. The Spanish explorer Hernando de Soto came upon them in 1539 and dubbed the "Springs of the Holy Spirit." Not until Dr. Salem Baranoff purchased it in 1944, however, did Safety Harbor take on the mantle of "health spa" by combining the therapeutic waters with body and skin treatments and overnight accommodations. Now under new ownership, it's going through a major renovation. Tennis at Safety Harbor takes place on five Har-Tru courts that overlook Tampa Bay. Kim Scullion directs operations, offering a mix of group and private lessons, junior clinics, kids' tournaments, and tennis socials. Courts & Fees. The 5 clay courts (3 with lights) overlook Tampa Bay. They're anchored by a two-story clubhouse, with several wooden terraces overlooking the courts, with the air-conditioned pro shop and that bigscreen TV on the upper tier. Court fees: $15/court-hour. Spa & Fitness Center. Developed and expanded over a period of more than 50 years, the spa now encompasses some 50,000 square feet. Meandering hallways provide access to the 40 treatment rooms and lead to the mineral-spring-fed indoor and outdoor pools which are used for the spa's renowned water-fitness programs. Massages run the gamut from traditional Swedish to reiki, shiatsu, aromatherapy, and shirodhara. Give the presence of those mineral springs, there are also many hydrotherapy treatments. With renovations has come an outdoor Sanctuary situated between wings of the hotel with an patio and fountain. "We're gearing to become a wellness center," says general manager Zachary Frangos. The room off that Sanctuary and the pretreatment areas have organic teas, cucumber water, whole fruit, and the like. The spa is supplemented by an extensive fitness center consisting of a cardio theater, a weight-training room, Pilates Reformer studio, and dozens of weekly classes, among them spinning, yoga, tai chi, and Pilates. The resorts's 175 rooms and suites are spread through four buildings ranging in size from one to six stories. All of them have terraces or balconies and views of Tampa Bay. The Fountain Grille restaurant offers dining on the patio, the Tiki Bar serves casual fare (sandwiches and salads), and La Sardine lobby lounge is a place to gather at the end of the day. 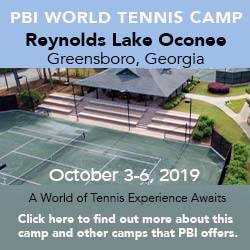 See the website for detail about room rates and tennis packages. Seasons. Year-round, though there is more tennis activity from September to May. Travel Instructions. It is less than a 20-minute drive from either the Tampa or St. Petersburg-Clearwater international airports to Safety Harbor. From the Tampa International Airport (TPA), head west on Route 60 and cross the Courtney Campbell Causeway. Turn right on Bayshore. At the four-way stop, the resort will be on your right. From the St. Petersburg-Clearwater International Airport, head north on Route 611 and cross the Bayside bridge. Turn right on Main Street. At the four-way stop, the resort will be directly in front of you. General Tourist Information. Visit the St Petersburg/Clearwater Area Convention & Visitors Bureau, website or contact them at 14450 46th Street North, Suite 108, Clearwater, FL 33762. Phone: 727-464-7200 or 800-FL-BEACH.